After The Historic Risk Parity & CTA Crash, What's Next? Last Sunday, following the Friday post-payrolls flush, but before the Monday volocaust, which was the consequence of the concurrent historic vol squeeze of inverse VIX ETF funds, coupled with the sharp deleveraging by CTAs, risk parity and various other quant funds, we predicted that recent events were a "recipe for disaster" and that "while everyone may have an opinion on what happens next" one thing that is very likely is that "risk-parity funds - those who benefit as long as both stocks and bond yields act in tandem - are set to suffer the biggest hit." Friday's equity market collapse and simultaneous bond market bloodbath was the biggest combined loss since December 2015, but perhaps more ominously, the week's combined loss in bonds and stocks was the worst since Feb 2009. ... and will be forced to significantly delever in the coming days - to the tune of tens of billions in net exposure - if the vol surge persists. One week later, with the market nearly 10% lower, vol funds around the globe in shambles, retail vol sellers crushed, the risk-parity blow up took place as predicted, in what now looks like the worst quant-quake since the summer of 2007. One answer comes from JPMorgan's Nikolaos Panigirtzoglou, whose latest Flows and Liquidity analysis traces the contours of last week's events, and who writes that "our analysis suggests that both CTAs and Risk Parity funds have been at the core of the recent correction", confirming what we said, and then posits what may happen next. Figure 1 shows the performance of various types of investors so far in February vs. last month. CTAs and Risk Parity funds appear to have suffered the biggest losses over the past week, more than erasing their previous January gain. Balanced mutual funds also suffered a heavy loss, more than erasing their previous January gain. In contrast, discretionary hedge funds such as Discretionary Macro or Equity Long/Short funds managed to preserve half or more of their previous January gains. This is especially true with Discretionary Macro hedge funds which appeared to have lost only -0.4% over the past week. 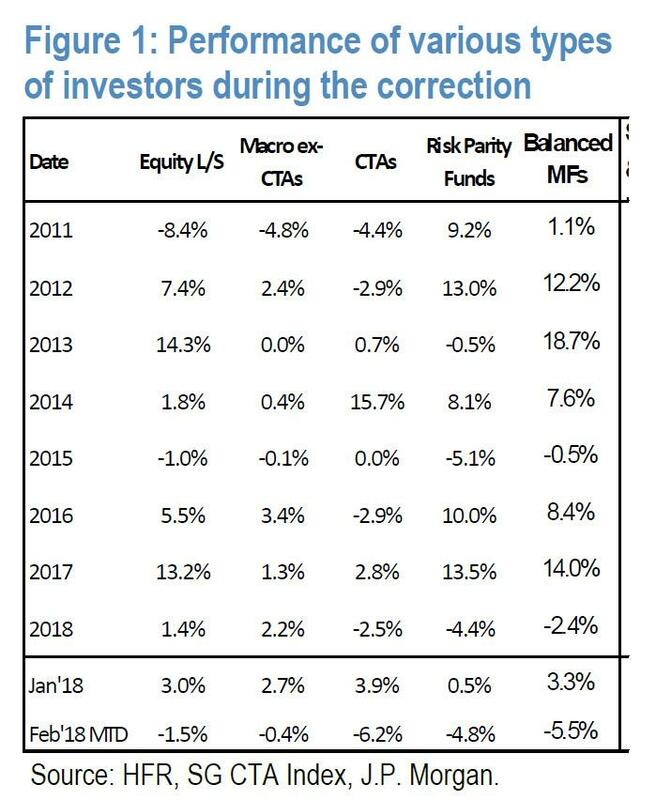 This confirms our previous thesis that neither Discretionary Macro nor Equity Long/Short hedge funds were very long equities ahead of the correction. Why have CTAs, Risk Parity Funds and Balanced mutual funds suffered by so much more? A simultaneous selloff of equities, bonds and commodities is the worst possible backdrop for multi asset investors such as risk parity and balanced mutual funds. 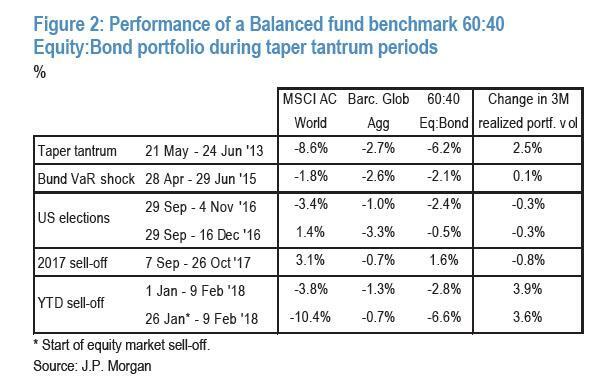 Indeed looking at the performance of a hypothetical Balanced fund 60:40 Equity:Bond portfolio, we find that the period over the past week saw the worst drawdown since the Fed taper tantrum of May/June 2013. Since January 26th the drawdown of a 60:40 balanced portfolio has been -6.6%, surpassing the -6.2% drawdown seen during the Fed taper tantrum of May/June 2013 (Figure 2). And the increase in 3M rolling realized vol at 3.3% has also been bigger than that seen during the Fed taper tantrum. The pressure on Risk Parity funds, which are stricter vol targeters than Balanced Mutual funds, to delever has been exacerbated not only by the shift in bond-equity correlation into positive territory, but also by the recent rise in equity/commodity correlation as commodity prices collapsed over the past few days along with equities. 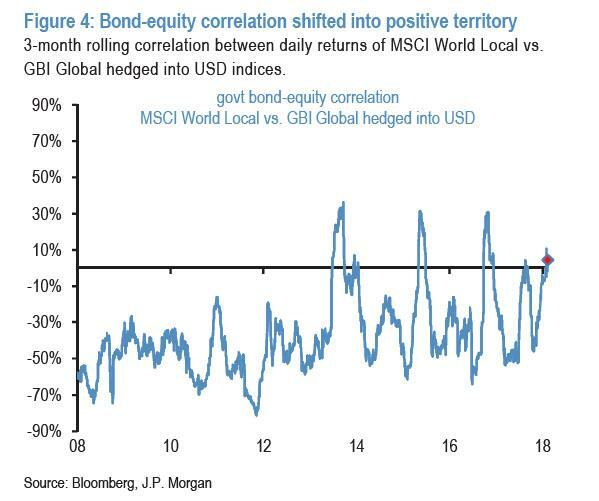 And while we pointed out the rising bond-stock correlation, JPM notes that a new potential threat is that the commodity/equity correlation has also starting creeping up - yet another potential risk-parity deleveraging risk factor - rising from just above zero at the end of January to +25% currently. This, JPM cautions, raises fears about further de-risking by Risk Parity funds. But here's the good news. In fact, it was so good, it sent the market soaring when the JPM note hit at 3:30pm on Friday. According to Panigirtzoglou, "we believe that any further derisking by Risk Parity funds will be more limited from here as they have de-risked already quite significantly." Specifically, "Risk Parity funds underperformed their hypothetical benchmark by 3.7%. This underperformance is even bigger than that seen during the Fed taper tantrum and is comparable to their previous de-risking seen into the US election." As we have been highlighting over the previous weeks, the momentum signal of several futures contracts was reaching extreme levels during January, raising the risk of mean reversion signals being triggered, i.e. profit taking from certain CTAs that employ mean reversion signals along with momentum signals. 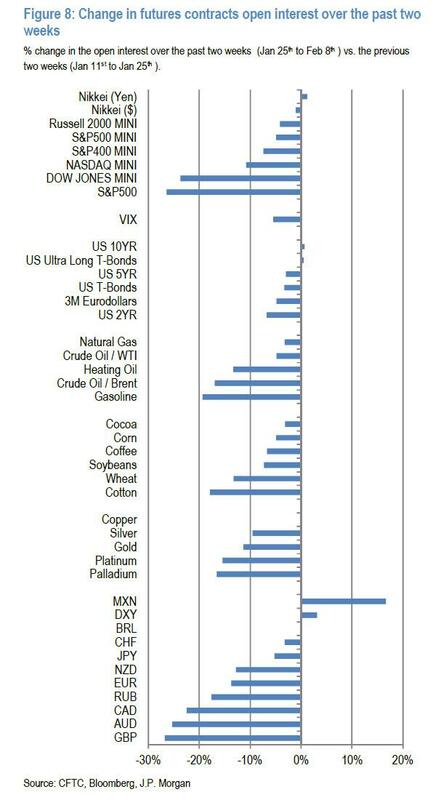 The first futures contract to get extreme was oil in mid-January, the week after were those of the S&P500 and MSCI EM indices, and then the euro and the pound at the last week of January. So it is possible that profit taking by those CTAs that employ mean reversion along with momentum signals might have contributed in starting the correction. But as the correction started unfolding, pure trend following CTAs were suffering from trend reversal, hitting stop losses on their momentum positions which they were forced to unwind. In a typical CTA, stop orders are placed for all open positions, i.e. when a trade goes against the fund, positions are automatically stopped out for a precalculated, limited loss. In addition, if there is high volatility, CTAs will scale down the size of their positions to main a relative stable VaR This combination of stop losses and rising volatility most likely triggered the most intense position unwinding by CTAs in the post Lehman period. Actually, make that the most intense position unwinding by CTAs ever. According to the SG CTA Index, overall CTAs lost 6.9% in four days from Feb 1st to Feb 7th. 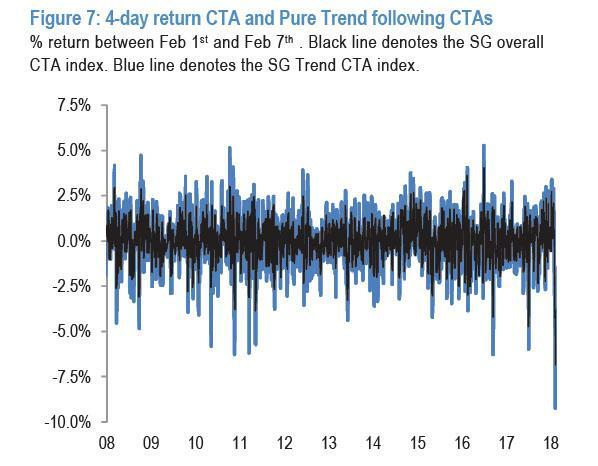 And, as JPM notes, "pure trend following CTAs did even worse losing 9.2% during these four days. In fact, the negative 4-day return for CTAs is unprecedented" as shown in the chart below. So between the violent deleveraging among risk-parity funds, and the biggest loss by CTA funds ever, what is left? 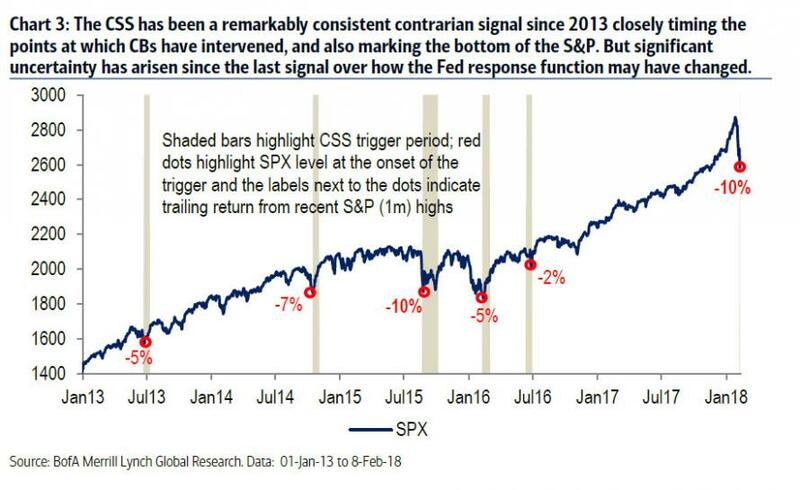 ... the position unwinding by the CTA universe has been so severe since the end of January, "that any position unwinding from here should be limited", JPM argues, especially if one assumes that stop losses have been triggered already. 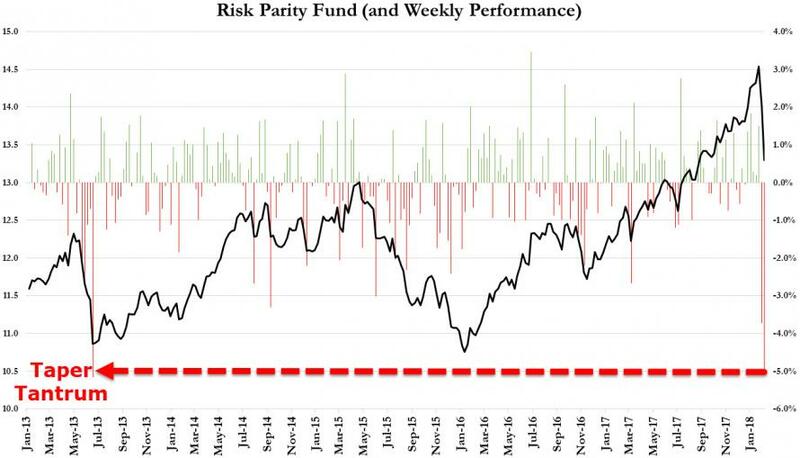 In all, our analysis suggests that both CTAs and Risk Parity funds have been at the core of the recent correction, and that the position unwinding that both suffered from has been so severe that any further position unwinding should be limited from here. In other words, out of the quants' ashes a new calm may emerge. Or maybe not: after all to relieve investor fears that more selling wouldn't emerge, on February 1, JPM's top quant Marko Kolanovic stated that "Equity price momentum is positive and trend followers are not likely to reduce equity exposure." Oops, because what followed was arguably the biggest equity exposure reduction in history. So yes, JPMorgan has a tendency to see things in a somewhat optimistic light now and then. There is another risk: echoing his warning from a week ago, which we described in "the worst case scenario", Panigirtzoglou concludes that the last great unknown risk is what retail investors do next. [The position unwinding], combined with the low equity exposures of Discretionary Macro and Equity Long/Short hedge funds, leaves retail investors as the residual risk for equity markets going forward. Retail investors had poured more than $100bn into equity ETFs during January. Of that $100bn, $40bn was invested into US equity ETFs. US equity ETFs, which have been at the epicenter of the fund outflows over the past week, lost $25bn so far. So more than half of the $40bn that had entered US equity ETFs in January has been withdrawn already. So again, the picture we are getting in the US equity ETF space is one of advanced rather than early stage de-risking. 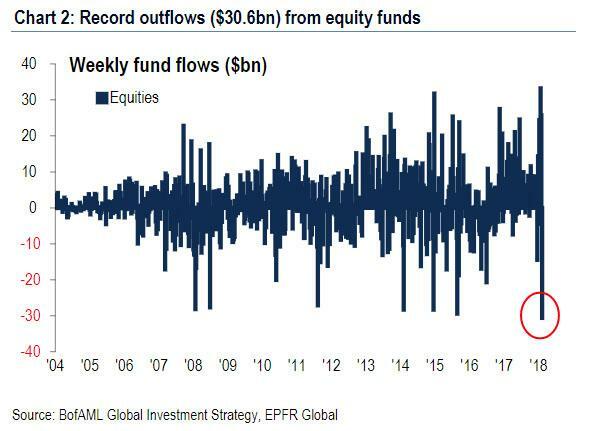 Furthermore, in another confirmation of the "worst case scenario", we wrote on Friday that just two weeks after record inflows, equity funds saw their biggest weekly outflow in history as retail investors panicked to get the hell out of Dodge. ... the only thing that stops it will be central bank intervention.